Portion control your dessert with a sous vide cheesecake in a mini mason jar. Once you have sous vide cheesecake you may never bake a cheesecake again. Be sure to check out my other easy sous vide recipes. Homemade mascarpone cheese and grapefruit infused gin are great recipes to try. This sous vide cheesecake recipe has a double stuf Oreo crust. Satisfy your Oreo cookie cheesecake sweet tooth. You will love this easy Oreo cheesecake recipe. I have been making cheesecake for the better part of my life. Normally I would have to wrap foil around the bottom of a spring form pan and place it in a hot water bath to get even cooking and prevent cracking. It is a big mess and chances are I would have a leak. I always had a leak. With this sous vide cheesecake method there is not leaking, there is no cracking, there is not excessive browning. There is not wondering if the center is completely set or not or if it will fall when you take it out. Sous vide takes all the guess work out of making cheesecake. Place your pot on a heat protected surface. Set the sous vide to 176 F / 80 C.
In a food processor, blend the 6 double stuf Oreos. Pulse until the Oreos make a crust that forms when squeezed. The extra filling will make the crust the correct consistency. If you don’t have the double stuf Oreos, just add a few tablespoons of melted butter. In a food processor, blend the cream cheese and the sugar. Add the sour cream and blend again. Scrape down the bowl and blend one more time. Press a tablespoon of the Oreo crust into the bottom of a 4 ounce mason jar. Pour the cheesecake batter into each jar and stop just below the threads of the jar. Wipe down the rim and place on a lid and a ring. Lower into the sous vide water and set the timer to cook. Make sure there is enough water in the pot to fully cover the jars. Cook the cheesecake for 60 or 90 minutes. Remove from the water and refrigerate until chilled. In my app it gave two different times for looking the cheesecake. I wanted to see if there was any significant difference. In my opinion there was little to no difference. But if I HAD to pick a difference I would say that the cheesecake on the right, at 90 minutes, was more dense. My take away here is that 60 minutes in minimum but 90 minutes won’t hurt anything. I did tap the jars, ok I banged them, on the counter to remove air bubbles. Looks like I missed a few! Garnish with extra Oreo crumb crust and enjoy! I can tell you with confidence that if you fill the jars to just under the threads on the mason jars, there will be enough room to place a full double stuf Oreo cookie under the lid and ring. Do this only after the cheesecake has chilled completely. 1/2 cup sour cream, 4 oz. 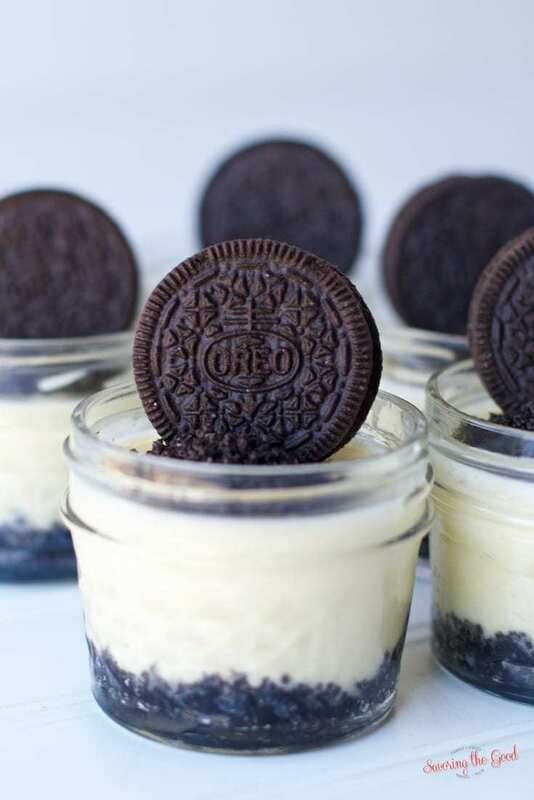 These are so cute and the perfect way to have my cheesecake without cutting that huge piece I know I want. :-) I’ve never cooked with the sous vide method but I have a friend that swears by it. I may just have to run over and make this at their house it looks soooo good. This sous vide method for making cheesecake has me intrigued. I have to give it a try since cheesecake is one of my favorite desserts. Yum! Cheesecake is my favorite dessert ever and Oreo cheesecake is one of my favorite types. I don’t cook with sous vide but I like seeing what people are doing with theirs. ADORE the individual servings! I have no willpower when it comes to a big slice. I am the same way! Now the temptation is to have 2 jars! Sous vide is so fascinating to me. You can do so much with it! It makes the SILKIEST cheesecake! You MUST ty it. Get out!? This looks amazing! This recipe is definitely a keeper! Thank you! Supper simple… right? !